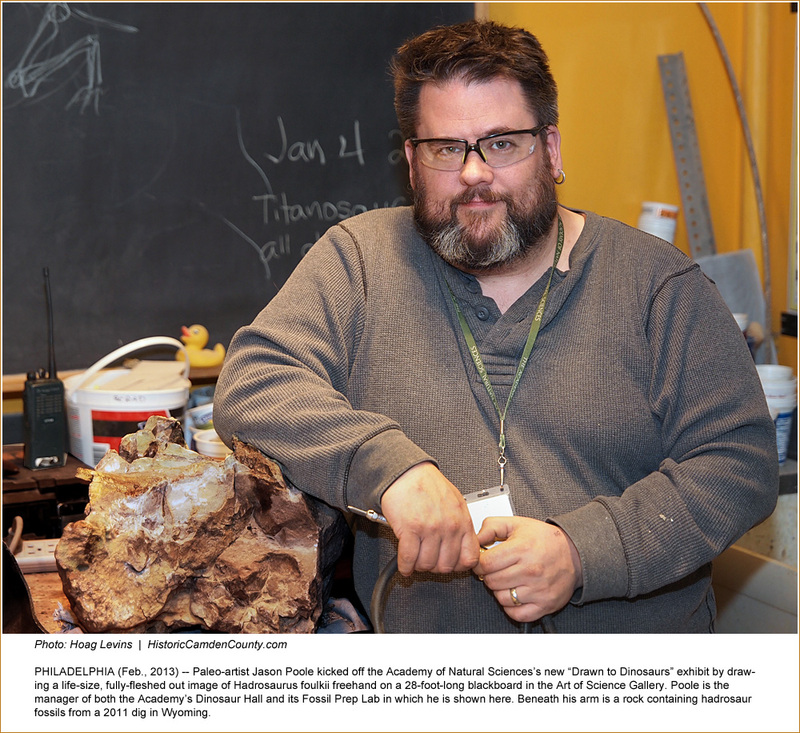 Paleo-artist Jason Poole executes a life-sized illustration of Hadrosaurus foulkii as part of the kick-off of a new display at Drexel's Academy of Natural Sciences. Click for larger image | Click to see finished Hadrosaurus illustration. 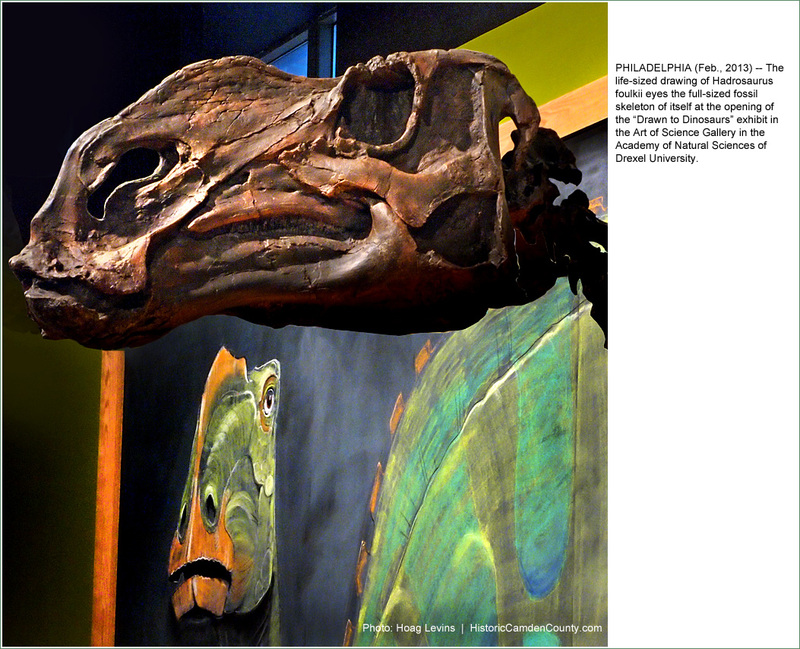 PHILADELPHIA -- Four years after it was taken apart and consigned to storage, the full-size skeleton of Camden County's famous dinosaur is back on display in a new exhibit at the Academy of Natural Sciences of Drexel University. in the Academy's Art of Science Gallery. 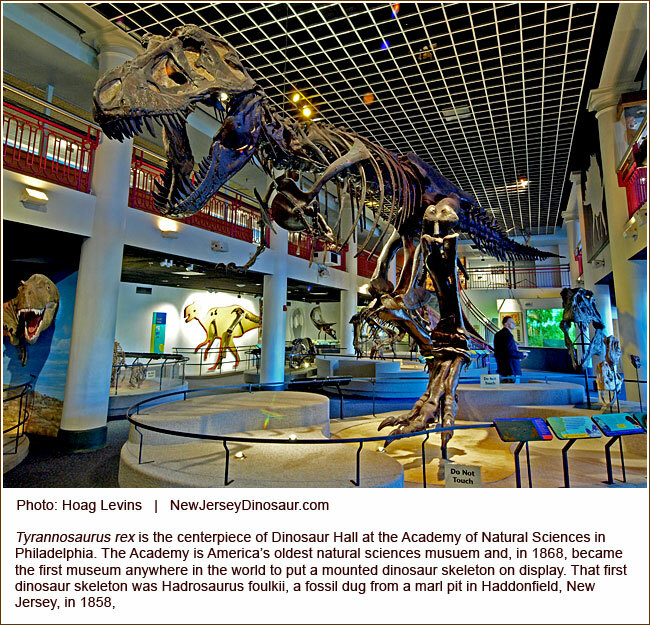 Cast from the fragile real fossil bones that remain locked away for safety, the skeleton was previously the focal point of the Academy's 2008-09 The Dinosaur That Changed The World exhibit that marked the 140th anniversary of the first display of the Haddonfield dinosaur fossil. 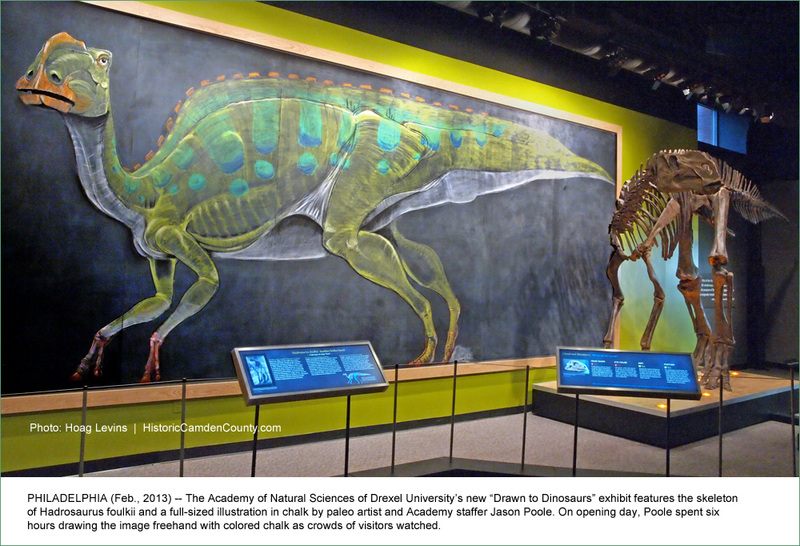 This new "Drawn to Dinosaurs" exhibit celebrates paleo artists as well as the Hadosaurus find that played such a pivotal role in the rise to that specialized art genre. 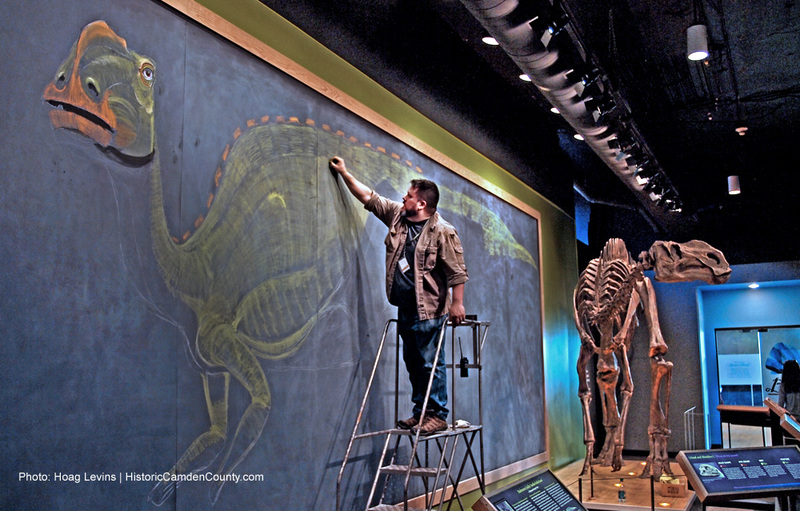 Combining those two themes in a unique way on the new exhibit's opening day, paleo artist Jason Poole spent six hours executing a life-size freehand drawing of Hadrosaurus foulkii on a towering 28-foot blackboard that is part of the display. 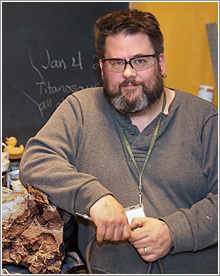 Poole, who manages the Academy's Dinosaur Hall and Fossil Preparation Lab, is an accomplished dinosaur illustrator whose work has appeared in publications like National Geographic and Science magazines, institutions like the Carnegie Museum of Natural History and the Smithsonian, and on his own Dino-Scribbles blog. Faced with creating the largest drawing he had ever done, Poole first planned to work on construction-worker stilts but abandoned that idea after testing it out. He ended up running up and down a wheeled warehouse ladder as crowds of visitors watched him work, peppering him with questions all the while. would be able to 'check my math' so to speak," said Poole. Throughout the day, he shuttled back and forth between the two, taking rough measurements of the real bones and then sketching those dimensions on the blackboard with colored chalk attached to a long stick. When it was over, he was surprised by the unexpectedly physical nature of drawing while constantly running up and down stairs for six hours and simultaneously fielding the crowd's questions. What was the most unexpected thing he was asked? "One adult asked me what I imagined this dinosaur would have smelled like," he said. Others asked about the artistic logistics of creating dinosaur art. Although Poole routinely uses computers for other tasks, he still executes all of his paleo-art with traditional chalks, pens, pencils, brushes and oils. He acknowledges that the paleo-art community is quite bifurcated on this issue. "There are factions now," he said. "A lot of younger artists who are very into digital mix computer art programs and photography to put dinosaur images into doctored-up photo backgrounds. 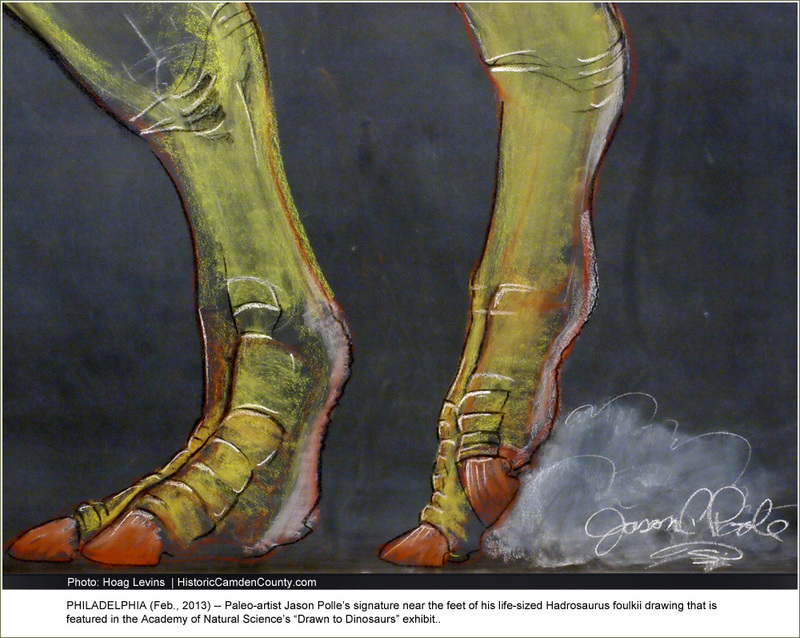 Others are using digital animation tools, like you see in Jurassic Park. And then there are the artists who are more classically trained and simply like the traditional methods. There's where my heart is. I like the way paint 'squishes.' Pen and ink are my favorite medium." community that traces its history back to the mid-19th century when artists began drawing imagined versions of the prehistoric creatures whose existence was suggested by that period's cryptic fossil finds but whose exact form had not yet been established by full fossil evidence. 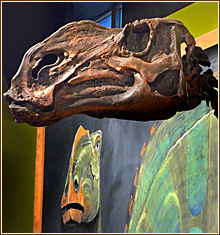 The 1858 excavation of the world's first nearly complete dinosaur skeleton -- Hadrosaurus foulkii -- and the 1868 public unveiling of that then-unique fossil on public display, triggered both the famed Bone Wars explosion of paleontological discovery and a similar explosion of dinosaur art accompanying those discoveries. Poole pointed out that over the last century and a half, dinosaur art has played a much more important role than most casual dinosaur hall visitors or "Jurassic Park" viewers fully appreciate. At the same time it has been great fun to create and view, paleo-art has effectively synthesized and disseminated vast amounts of dense scientific data that would not otherwise be easily understood. "One point this new exhibit wants to get across is that every image of every dinosaur you've ever seen in any media has come from the heads and talents of an artist, and there is a large community of these dinosaur artists all around the country as well as the world," said Poole. "Our job is to translate the scientific facts of what these creatures were into visual reality so that people can put them context." He also discussed the debate over how paleo-artists should deal with new discoveries that change what we know about dinosaur physiology and behavior. Over the last 50 years as artists have been creating dinosaur images based on the latest scientist knowledge, that knowledge has changed dramatically. Two instances of this have to do with feathers and the essential birdlike "stance" of many dinosaurs. "Feathers have affected paleo-artists more than any other recent change in what we know about dinosaurs," said Poole. "But the art that existed before these discoveries is part of the historical representation of what humans knew or what we thought we knew about dinosaurs. Luckily, a lot of artists are not changing their earlier pieces because they understand that those images are part of an important historical record." 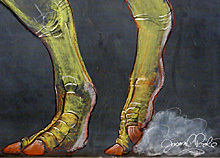 Prior to feathers, new knowledge about the bird-like posture of many dinosaurs raised a similar quandary for artists and the museums they serve; the Academy itself become one of the world's first institutions to display creatures like T-Rex in the correct bi-pedal stance that had backbone and tail in a horizontal -- rather than vertical -- alignment as they walked. Poole, who grew up in Philadelphia, has been collecting fossils since he was eight years old and first accompanied his father on amateur fossils digs in upstate Pennsylvania. 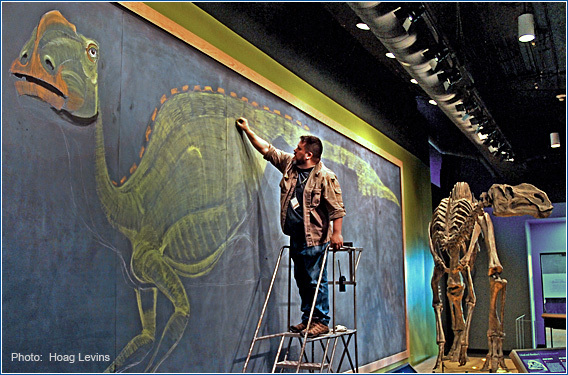 During his adult career so far, he has participated in major dinosaur excavations in Egypt, Patagonia and various U.S. states. During most normal working days, he can be found in the Academy's Fossil Prep Lab chipping solid rock from around fossilized bones that haven't seen the light of day for 70 millions years or so. Currently, he and his team are working on chucks of rock that contain the remains of a Hadrosaur unearthed in Wyoming in 2011 by a team from the New Jersey State Museum in Trenton. "I have such an incredible job here at the Academy," said Poole. "Someone pays me to do work that is so much fun that sometimes, when I'm doing it, I feel like I'm 'getting away' with something."